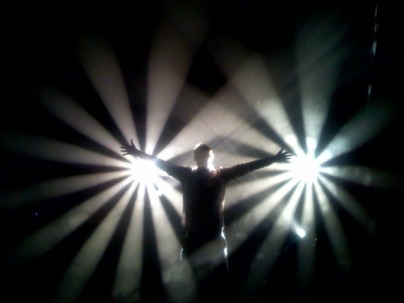 Lighting Design - It's all about the LIGHT! Prior to working at Valencia, I was a Freelance Stage Master Electrician and Lighting Designer in Greater Central Florida area including, Tampa and Daytona Beach; also, Manhattan & Brooklyn, New York, Portland, Oregon, Seattle and Bainbridge Island, Washington to name a few. I have been in Live Show Production & Theatre Since 1994. I began as an actress and technician in high school and quickly fell in love with the electrical lighting part of theatre. My very first lighting position was as a spot light operator for school plays and I became so good at it, I was being scheduled and paid for touring Broadway productions that visited the Flagler Auditorium 1994-1996 ( http://www.flaglerauditorium.org/ ) as a spotlight operator. I also took T.V production classes and enjoyed working on lighting for the screen/camera. So upon graduation from High School I tried to find a school that offered both program degrees. I found Valencia. I graduated from Valencia in 1998 with a A.S in Theatre and Entertainment Technology degree, and had also worked on several film production projects as well, especially in special effects makeup and production assistants. I worked at Universal Studios at the Nickelodeon Game Lab, Horror Makeup Show and Special Events, the best part, I got gun training, because my stage had a fixed prop gun. I moved to back to N.Y to pursue a degree in Lighting Design. However, when I got to Pace University the program changed, I decided to transfer to Fordham University Lincoln Center, and got my undergraduate degree in Theatre Production & Visual Arts. While in school at Fordham, I worked as a Freelance Tech at the Marionette Swedish Cottage Theater (puppet lighting) small scale and adorable which is connected to the Recreation Parks Foundation for N.Y.C. 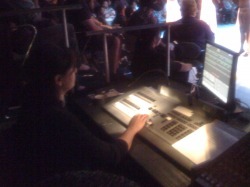 I also did lighting design and stage management gigs on the side. 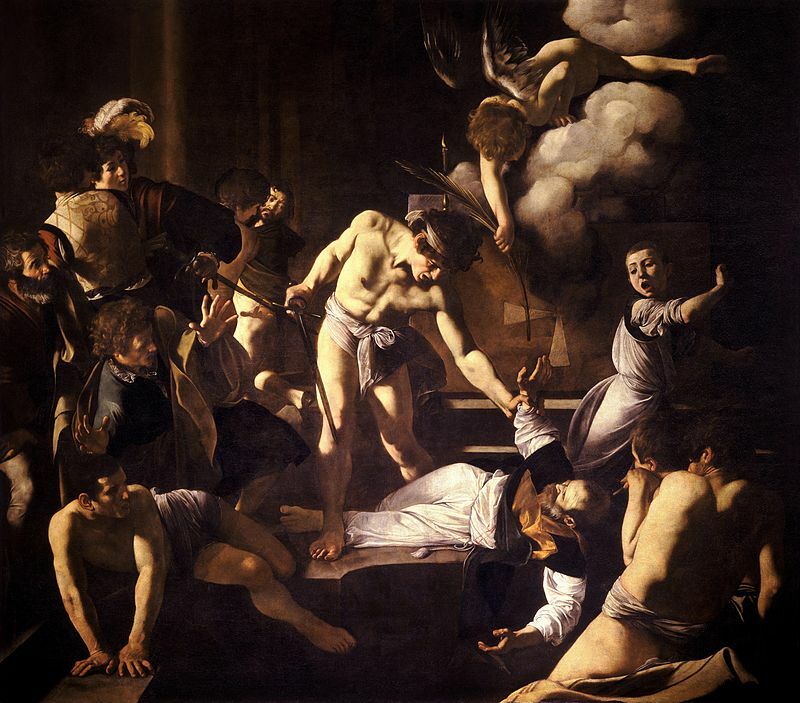 My favorite was lighting Galleria del Angeli by William Kernen and my inspiration was to make the performance resemble a Caravaggio painting, which I was studying at the time in Art History. The best review I heard an audience member say on the way out of the theatre is how it reminded her of a Caravaggio painting; nailed it! I had an opportunity to work on a new production at the time as an electrician, but it was an opportunity missed, it was called Avenue Q. Hahaha, yes, I missed out. After graduation I moved back to Florida because N.Y was too expensive, I had a house to get back to and the rat race wasn't for me. I was tempted to stay and take up an offer to work as the Artistic Director for the New School, but I felt it was not what I truly wanted to pursue out of school. I moved back August 29, 2001. Then Sept 11th happened, I was heart broken for the city and our country. The doors to entertainment shut down first. As work was slow, I taught myself how to build websites from scratch and studied html/php, but once work picked back up, I continued my journey freelancing all over Florida State. One of the first places I returned to was Valencia to see if I could design a show. 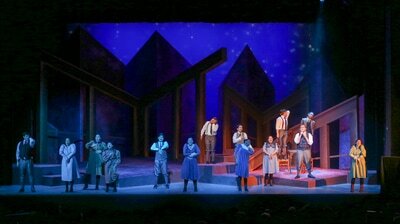 My first show was Annie Get Your Gun, 2001 on the main stage. I have been designing here, many other stages ever since. It wasn't until Fall 2007, after leaving Disney, did I begin teaching at Valencia. I taught Lighting the Disney Way, a course developed just for me to teach managers and others who ran the park to learn more about lighting, safety and troubleshooting. The rest I will fill you in, let you know what I have learned and share it with you in class. Feel free to ask me anything on Lighting Design, it is my first love in the field. 1. What are the functions of light? 2. List 5 types of performance spaces. 3. What are the controllable properties/qualities of lighting? 4. What is standard voltage in a US Edison outlet? 5. W=V x A is called what? Why do we need to know this formula? 6. The McCandless Theory established what for stage lighting? ​7. List the primary colors of light? 8. Secondary colors or color triangle of lighting? ​10. What are gels also known as? Creating a mood- what is the mood in this photo? I don't know about you, but I feel relaxed, calm, comfortable. A lighting designer does her or his best to reinforce what is being seen or viewed by the audience. A great lighting designer knows how to keep it simple, yet effective and stays true to the goal. There is Power in Awareness! Observe the sunlight on the snow. Location, season-temperature, and atmosphere really plays on the colors distributed from the source of natural sunlight. Michelangelo Merisi da Caravaggio (1571-1610), Rome, Italian artist, achievements during 1592-1610 during Baroque Renaissance. Chiaro- clear and bright and Oscuro - dark, shadow and obscure birthed in 17th century Italy the Chiaroscuro light and shadow painting technique gave highlighted a new art form that focused on everyday human life. The reflection of his works is inspired by the political autocracy government during the time when the Counter Reformation for the Catholic church was surging. The need for religious order and political framework wanted to shape the image of the nation. 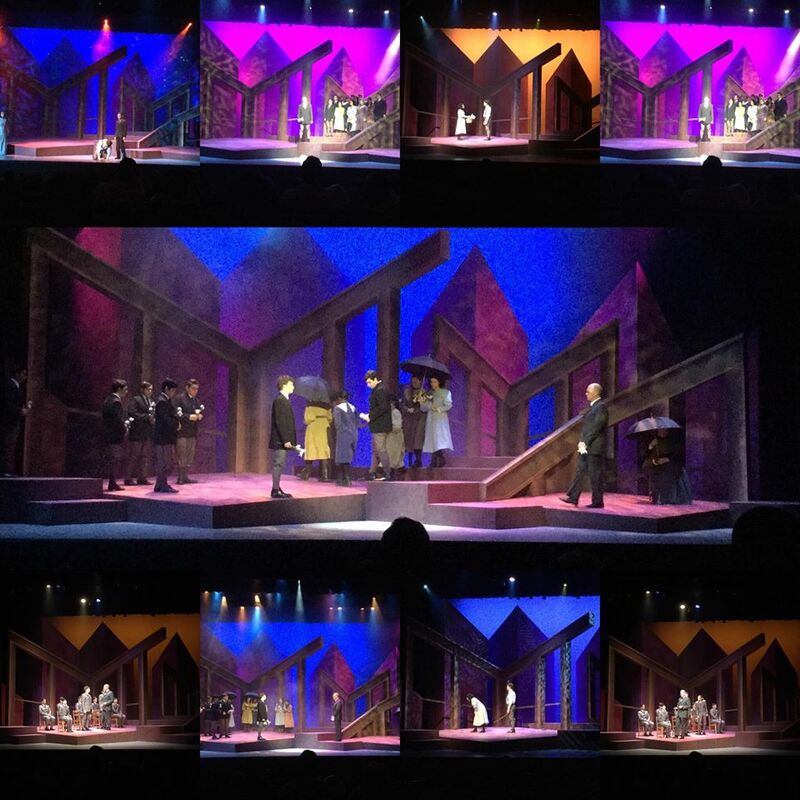 Stage Pictures snapshots by Caravaggio. 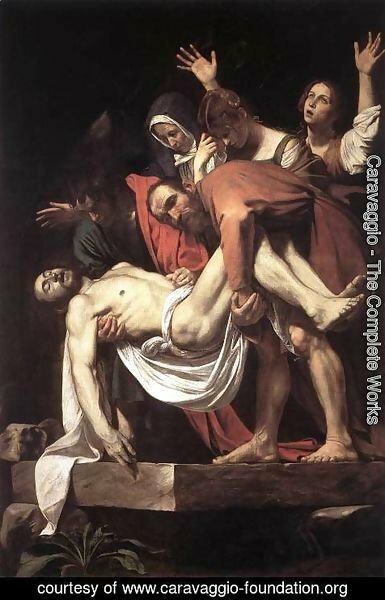 The Entombment of Christ makes for an intense "stage picture", image it is the PAC stage, where would the front light be positioned? What gel would you use, what light would you use and what intensity would those lights be set to? The Fortune Teller can be seen as another "stage picture" as the sly teller stares into the young man's eyes while she reads his palm and slides off his ring. The natural, romanticized gestures from the gypsy lends to warn the society of frauds. Calling of Saint Matthew is called by the Christ depicted by the light to follow him. 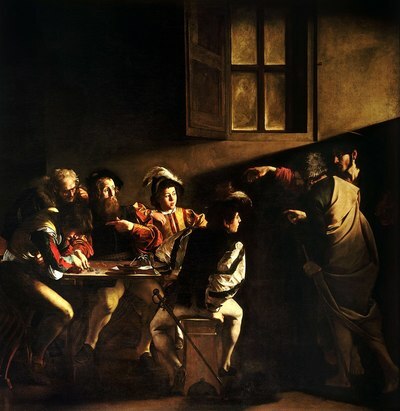 The inner voice, the light and the suggestion of the Christ, represent the spiritualism of the era, as Matthew is captivated to follow the light portrayed by his stare. 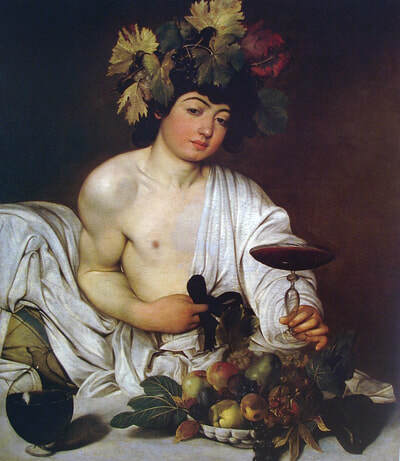 Bacchus in Greek known as Dionysus the God of wine and art, ecstasy and licentiousness. The wine glass is almost empty as the young male offers us some to drink. All the while it resembles a sand time capsule, depicting time is running out, come enjoy the fruit and wine with him. 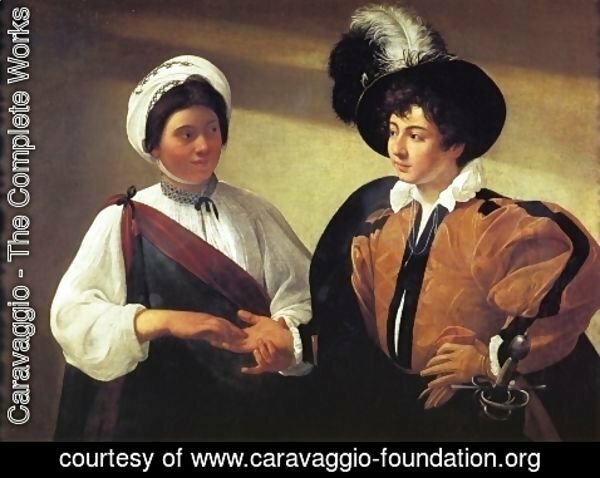 The humanist roles Caravaggio paints is realistic to the human figure and vices. ​Creating an atmosphere, creating an environment! This very thing reinforces what is being viewed. 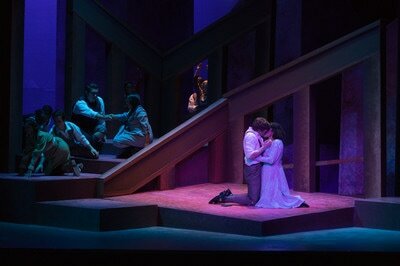 I believe that I am a fairly good lighting designer. I do have savvy way with color and texture. I do hear and pay attention to what the mood and emotions are in a piece of music, dialogue or dance movement. There are certain QUALITIES one should possession as a lighting designer, especially when you a lighting for entertainment. I am always paying attention to the source of lighting in my environment, the intensity, color temperature (I hate fluorescents with a passion, it makes me feel ill and see blurry) and or it is good (meaning functioning for the purpose)? What I feel attributes to this is my sense of awareness to my surroundings! As the # 1 function of light provides is illumination or visibility, that is how a person can see what is simply going on. I love to observe nature, I am always admiring how the sun and moonlight pass through my window, door panes, crescent windows and reflects in the pool water. Have you ever tired to hang a crystal in the window of your home, just where the evening or morning sun can hit it. It reflects the colors of a beautiful spectrum of light, colors of the rainbows. At the end of the day, anyone can light up a stage and do flash and trash or add some smoke and think it looks great. I am here to teach you what to listen to, how to have an eye for designing, the art of lighting, the purposes, developing creativity from within yourself. You either have it or you don't, but certain information can help an aspiring lighting designer open up ways of viewing the world of lighting like never before. Example: Before working in night clubs, lighting to music was new to me, once I was on to how to listen, what to listen to, the style of lighting to use, I began a new journey with lighting.... It is never to late to learn. The design of lighting begins with an idea! Those ideas stem from what the Director of the production has a vision of, that vision becomes key, in how the design team interprets the script and vision. To be a strong and effective lighting designer, understanding the basics is very important. The basics begin with what we observe on a daily basis around us in the world, our environments and how natural, artificial, special effect lighting or even the "green" movement of lighting is playing a role in daily lives. Example: What does your room look like in the morning? What light would you see first? Where does it come from? What is its source? The last time you looked up in the sky and truly notice it, what time of day was it? What color(s) was in the sky? We are going to now take a walk in nature. I want you to observe a few things. 1) What is the color, describe of the light source, are there clouds? How does the light source reflect off of the clouds if there are any? 2) Trees, find some, now where are the shadows located that are cast from the trees? What time is it? Describe the breakup pattern of the shadows that the tree leaves cast. 3) Look at the palm of your hands, what is the intensity of the light source, give it a percentage from 0 to 100%,what would it be right now? Why, explain, are there clouds or an absence of clouds? Take a notebook and pen and walk with me! Let's see what Visual light we can view today! LET"S OPEN YOUR ARTIST EYEBALLS!!! Light hitting a reflective or shiny surface. When light hits a reflective surface, it bounces in more than one direction. The type of reflective surface, be it a mirror, shine or water that is clear will reflect and refract the light into several directions due to the (rays and waves) of light hitting areas of the surface. Sun beams - Natural beamage! The sky is one of the hardest recreations for a lighting designer, especially if they do not have the right equipment. Projection used now a days can give a clearer depiction of a natural sky. Lighting can come close enough, with color, texture, some angle lighting and high quality static lighting. The distribution or location of where a light source is place plays an important role in achieving a desired look. Back positioned lights, either at a high, mid or low angle helps to shape, separate from its background and reveal the silhouette of an object. This photos uses a natural light source, look at how the flowers stem, petal flower is shaped and even down to the tiny hairs on the stem. Be Careful as the opposite of low or mid back light is low or mid front light. Low to mid positioned front light, creates shadows. Shadows can be distracting or even upstage a performance and really be annoying, not cute as the photo to the right. Unless if this is the desired effect for a scene or piece to create a distraction or shadow from a low to mid position front light, the audience will see every movement the performer makes. Hence, this is way the front McCandless is at a higher angle position 35-40 degree in height as you do not want a front light position that is too high, otherwise, that causes deep shadowing below the performer's eyes. This can make the performer appear really sick, creepy and or aged. 1) Lighting Designers need to be able to see the world around them with a clear understanding of the nature of light in simple terms. 2)Location: Northeast/ December - If the a person is outside, it is night time and the moon is full, stars are bright in the sky and they are near a river bank. The two people sit by the edge of the river bank, what is the source of light in this scene? What color is the light source? Use the swatch book to pick a hue. 3) Location: Florida/ Summer time - The same couple people are sleeping in their bed and its morning time, they have huge windows in their room that let in natural light. What is the source of light in this scene? What color is the light source? Use the swatch book to pick a hue. 4) Location: Northeast/ Fall time - The same couple is walking down the street of the busy city around 8pm of Times Square, lots commercial buildings with plasma screens advertising their products and Broadway marquee lights are scrolling light crazy. What is the source of lights in this scene? What are some colors you may see? Use the swatch book to pick hues. 5) Explain the purpose of a doughnut when placed into an ERS, what does it do to the gobo/template? 6) A profile as the book calls it (ERS or Leko) can be defined as what type of light? Meaning what are several ways you apply this light in any kind of lighting design? 7) A Fresnel (step lens) can be defined as what type of light? Meaning what are two possible ways you can apply this light in a performance area 6'-8'? 8) What is a birdy or inky? 9) What are the primary colors of light? 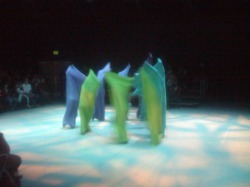 BELOW: Lighting Design for Live Entertainment class Aug-Dec 2008. Michael aka "Woot", Jon, Amanda, Susanna, Marilyn, Cat and Richard. 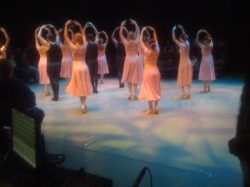 A few pics of their final lighting design project for multiple dance lighting pieces, in the Black Box Theater! 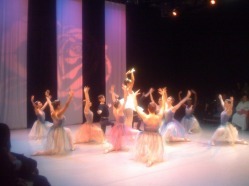 Celebrating a successful dance show for the Valencia College Dance Program. The last picture to the bottom right is the in class lab on creating what I call, "Beamage". Recreation labs, active learning project lab, will help to demonstrate to the students how to light a scene(s). Recreation lab, presents a video clip in which the students will discuss from previous knowledge; the types of conventional lighting instruments to use, the hang/placement positions of these instruments, the focus and applying color, which is minimal. ​The back story to this movie with Christian Bale, is that no one should have or display any emotions or feelings, it's the government tactic to control the citizen's of the city. If you feel anything, you are a "sense offender". The lighting throughout the entire movie is well orchestrated to support the theme, until their is any sense of feeling, you will see a difference. A little background on my journey of learning to light to music. It all began at Disney World. I am a child of the 80's and 90's and I am American-Caribbean, born and raised in NY, moved to FL in the early 90's, and I love a different set of genre's of music. I've listed some examples of songs we can begin to create cues for on the ETC Element console in Labs. ​Usher, Yeah! Oh my goodness every Hip Hop club I work in on the "Island" played this song.